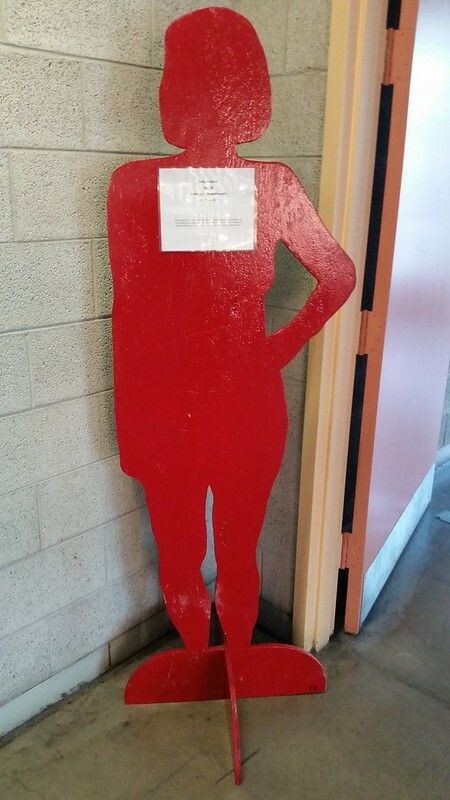 A wooden cut out of a female, painted in red and with a sign in its middle identifying who this cut out represents. These cut-out stands could be found throughout the University of Massachusetts' Boston campus the last week in October. They were haunting and were placed in well-traveled and not-so-well traveled areas throughout the school. Each had a paper in their center explaining who they represent and what happened to that person. Each cut out represented a person who had been killed because of domestic abuse. It's a powerful presentation as it puts form and narrative, but not face to this crime. The failure of the face is powerful because it reminds us of how domestic abuse is often invisible and a reminder to the silence that now stands in place of the person who was there before.